The word “bagel” comes from the Yiddish word “beygl”. Bagels are always round with a hole in the centre. It is thought that bagels originated in Poland in the early 1600s. 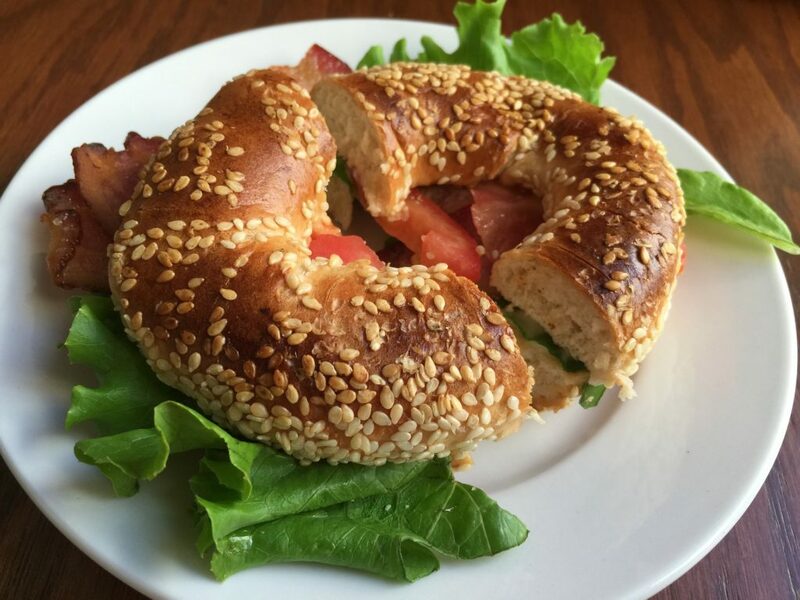 Bagels are closely connected to the Jewish community since it was the Polish and Russian immigrants that brought the Eastern European staple to North America. The most popular bagel is plain; second is sesame seed. Favourite bagel topping is cream cheese. In a medium bowl, dissolve the sugar in the 1 cup lukewarm water, then stir in the yeast. In another bowl, stir the warm water, egg, oil and salt; set aside. Add 1 cup of the flour to the yeast mixture and stir in. Add the egg/water mixture and 2 more cups of flour and stir, always in the same direction, until a smooth, moist dough forms. Add 1 more cup of flour and stir to blend it in; the dough will be quite stiff. Knead for 5-10 minutes on a lightly floured surface until smooth and elastic. Place dough into a clean, medium bowl and cover with plastic wrap. Let rise for 1 ½ to 2 hrs, or until soft and doubled in volume. Gently punch and let rise again for 1 to 1 ½ hours. Cut dough into quarters and work with one piece at a time, leaving the others covered with plastic wrap. Cut each piece of dough into 8 equal pieces (1 ½ oz each). Roll each piece with your hands into a skinny rope, about 10 inches long; let this rest while you roll another one, then return to it afterwards because it may have shrunk. Begin to form a seam with the two dough ends: pinch overlapping dough ends together and place palm down onto work surface to encourage the seams to stick together. Place the bagel on a baking sheet and shape the remaining pieces of dough. Cover with a cotton cloth and let stand for 10 minutes. Meanwhile, bring 8 cups of water to boil in a large pot. Add honey and stir to dissolve; have a slotted spoon ready. Put seeds on a large plate. Gently slide 4 bagels into the boiling water. They will sink and then rise to the surface within 10 seconds. Use the back of the slotted spoon to gently press them down into the water occasionally and let boil for about 45 seconds. Remove with spoon, one by one, and lay on seeds. Repeat with the next four bagels. Place bagels on baking sheet lined with parchment paper with 1 inch between them. Bake for about 8 minutes, then turn over and bake for another 5-7 minutes or until golden brown.